Not all of them are validated - so please send me feed-back! You can find an incredible amount of stories of giants, from the east coast to the west, from the north to the south. Bones, skulls, six fingered fossils, tombs, mounds, caves. Newpaper-articles were written and archeological research done. But where are the findings now? Iowa, USA: A local farmer struck a deposit of very hard stone about nine feet below the topsoil - just outside of Kossuth Center. Seven mummified remains of some giant humanoid race were seated in a ring around a very large and deep fire pit. They were each fully ten feet tall even when meas ured seated in their cross-legged positions. The foreheads were unusually low and sloping, and they had double rows of teeth in their upper and lower jaws. The hair of each of them was distinctly red in colour. Texas, USA: The picture shows one of many human footprints contemporary with dinosaurs taken from the Paluxy River located in Dinosaur Park near Glen Rose. It exceeds 45 cm (18 inches) in length. The cross-sectional cuts determined through compression studies that it was a woman's footprint. Estimates indicate her stature approximately 305 cm (10 feet) and 454 kg (1,000 lbs). Several strata of human prints with dinosaur prints have been excavated in this park. 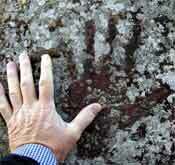 Michigan, USA: The picture shows a large handprint of the giants supposedly mined in Michigan in very ancient times. It is estimated that half a billion pounds of copper were mined in tens of thousands of pits on Isle Royale and the Keweenaw Peninsula of Michigan by ancient miners over a period of a thousand years. Indian legends tell the mining was done by fair-haired marine men. Obviously very large/tall! The Spaniards were looking for gold - and they found quite a lot, even if they did not find the fabled citiy of gold, El Dorado. They were not so interested in old bones and stories about giants, but there are plenty! Patagonia, that was what Magellan called the land close to the southern tip of South America, during his voyage in 1519. He encountered giants there, and it is said the head of one of Magellan's middle sized men reached but to the waist of the giants. There was another tribe, which was called Tiriminen, who also were of a gigantic stature, being 10 or 12 feet high, and continually at war with the other tribes. Peru's gold museum is private and not open to the public, so only a few have seen the golden-clad giant king. The mummified head of the crowned king in the photograph is about twice as large as a normal head. A golden tunic hung on the wall is made of spun gold, over eight feet tall and tailored in such a way as to suggest that it was not intended to drag on the floor behind a king, but rather to hang straight down. The Maya calendar tells about four periods when the human race were almost wiped out by catastrophes - we are now in the fifth and last. Pyramids, gold, human sacrifices. Rulers and gods - and giants. The country of Mexico is rich in ancient artefacts - and legends about giants. The largest of the pyramids of the ancient city of Teotihuacan, those of the Sun and Moon, were said to have been built by the giants that existed in those days. Legends assert that Teotihuacan was built by giants with the purpose to transform men into gods. The Pacific Ocean covers almost 1/3 of the earth's surface, and is dotted with small islands - from Australia to Hawaii. But no matter how tiny the islands are, you will always find legends about giants. And some places you will find statues, footprints, and even graves. Fiji: Rotuma is an isolated island far north of the main islands. 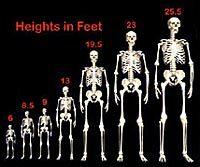 During the Second World War, coast watchers uncovered shin bones over 3 feet (1 meter) long, - only a 12 foot (4.5 meter) tall man would have leg bones that size. In the same area, the people found caves filled with giant human bones. Kiribati: On Tarawa, the main atoll of Kiribati, I found the footprints of a giant, his wife and children in a schoolyard - in the village of Banreaba. They all had six toes. 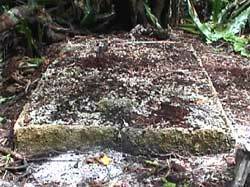 Erik Von Däniken found one untouched 5,3 meter long grave in Kiribati, where a giant is said to buried, but were unable to examine it. The people are even today very afraid of ghosts. Federated States of Micronesia: On the island of Pohnpei (Ponape) in Micronesia are some very interesting ruins called Nan Madol. This ancient city of stone is built on 90 artificial islands situated on the southeastern side of the island. Bones of giants have supposedly been found both inside the ruins and in the dense forest on the adjacent island. Australia: Rex Gilroy has discovered giant footprints in Australia. He has also found hand axes, clubs, ponders, knives, and other stone-tools so huge that only giants with extra large hands and strength could have made use of them. Estimates for size of these giants range from 10 to 12 feet tall and over. Aboriginal legends tells of giants living there when they arrived. Tuvalu: On the atoll of Nukulaelae there once lived a giant named Tevalu. Two brothers finally killed Tevalu. A few years ago Japanese archaeologists found what the old villagers said was the giant's grave, 3.5 meter long. The villagers at first wanted the archaeologists to open the grave, but then changed their minds: It was too dangerous! We have all heard about Goliath that was slain by David, but there are other giants in the Bible. Other ancient scriptures tell about giants as well, and there were some large vikings. And a fossilized giant on show! Israel/Syria: Goliath, the famous giant slain by the later king David, was about 12 feet (3,66 meters) tall. He was one of the last giants, the Anakim. Another one was Og. These giants were the offspings of the sons of God and the daughters of men, as citied in Genesis 6:4. Also Goliath, according to the Bible, he had six fingers and toes. Israel/Syria: The giant was 10 feet tall and his tomb was 28 feet long. Half of the tomb was filled with his armor and spear. The Technical Sergeant is holding his turban which has a brass liner inside, note the size! Xerxes, king of Persia, is portrayed as seven feet. Legendary Gilgamesh was half god and half human, a Sumerian. He had six fingers and was very tall - see the lion that he is holding! Gilgamesh was regarded as superhuman. In the Epic of Gilgamesh he is said to be 11 cubits (approximately 18 feet) tall, and his punt poles were each 60 cubits long. If Gilgamesh existed, he probably was a king who reigned sometime between 2800 and 2500 BC. The Sumerian King List says that Gilgamesh ruled the city of Uruk for 126 years. Egypt: The kings of ancient Egypt were often said to be giants. The king Khasekhemui (also spelled Khasekhemwy and Khasekhem, ca. 2690 BC) was the final ruler of the Second Dynasty. He was 5 cubits and 3 palms high, about 8 English feet (2.44m), if the short cubit of 17.4 inches were used . If we use the Royal Cubit his height increases to 14ft, 7in (4.45 meters)! Ireland: A fossilized giant was discovered during mining operations in County Antrim, in 1895. The giant was 12ft, 2in tall and had six toes on the right foot. The gross weight was more than 2 tons, so it took half a dozen men and a powerful crane to place this article in position for a picture. The giant was brought to England and exhibited, but was later lost. There are plenty, but often very sketchy reports of giant human skeletons being discovered in this part of the world. So please do send-in information and pictures! Philippines, Sri Lanka, Bangladesh: A human skeleton 5.2 m (17 ft) tall was unearthed at Gargayan in the Philippines. In Sri Lanka explorers found the remains of humans about 4 m tall, and at Tura in Assam, near the border of Bangladesh, a human skeleton measuring 3.4 m was discovered. There are not that many reports of giant skeletons being discovered in Africa. So again: Please do send-in information and pictures! In 1936, two French archaeologists, Lebeuf and Griaule, led an expedition to Chad in North Central Africa. They found large numbers of mounds. They dug up several egg-shaped funeral jars that contained the remains of a gigantic race, along with pieces of their jewelry and their works of art. These giants, according to the natives, were called the Saos. Do you have corrections, comments, other stories or better pictures? Please send me some words, use the send-in pages or terje@sydhav.no.